June 12 is Philippine Independence Day. Philippine Independence Day (also known as Araw ng Kasarinlan and Araw ng Kalayaan) is celebrated as a national holiday in the Philippines. 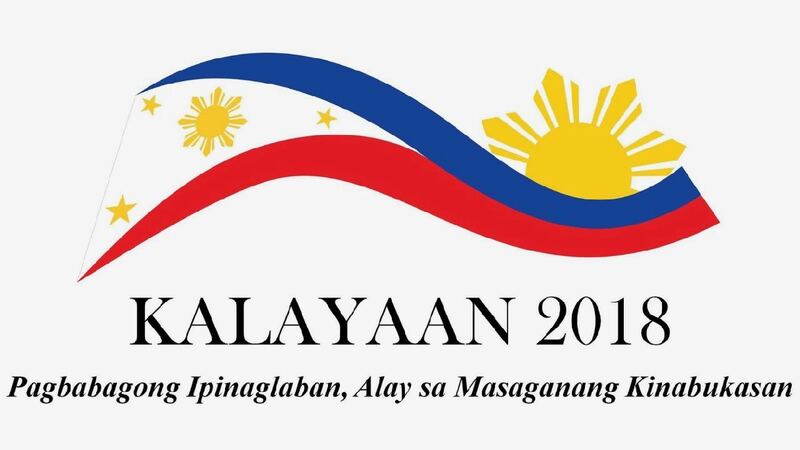 Philippine Independence Day is observed on June 12, marking the Philippine Declaration of Independence from Spain. The Philippines made the declaration on June 12, 1898. It has been the country’s National Day since 1962. The Government of Canada is represented by the Embassy of Canada in the Philippines. The Government of Canada also maintains a Consulate in Cebu. The Philippine Government is represented by the Embassy of the Philippines in Canada. The Philippine Government also maintains Consulates in Toronto, Vancouver and Calgary, and has honourary consuls in Edmonton, Winnipeg, St. John’s, Halifax and Charlottetown. The Filipino Canadian community in Canada has grown rapidly since the 1950s. Today, there are approximately 851,410 Filipinos in Canada. Tagalog is the fastest growing language in Canada. 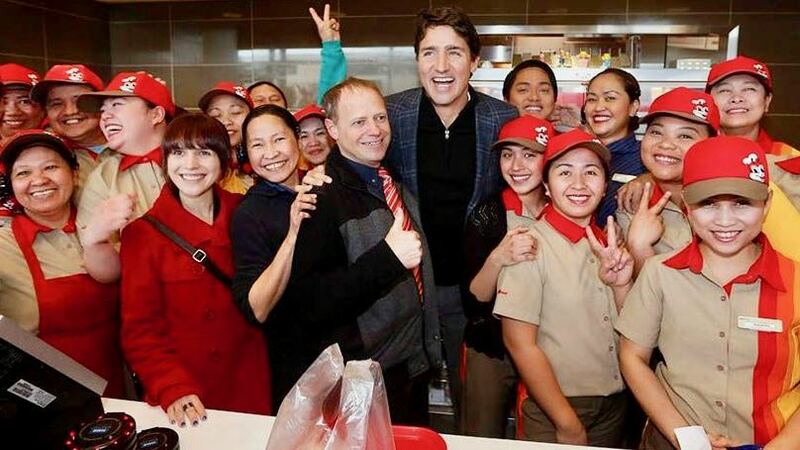 Justin Trudeau, Canada’s 23rd Prime Minister, is super popular with the Filipino community in Canada. 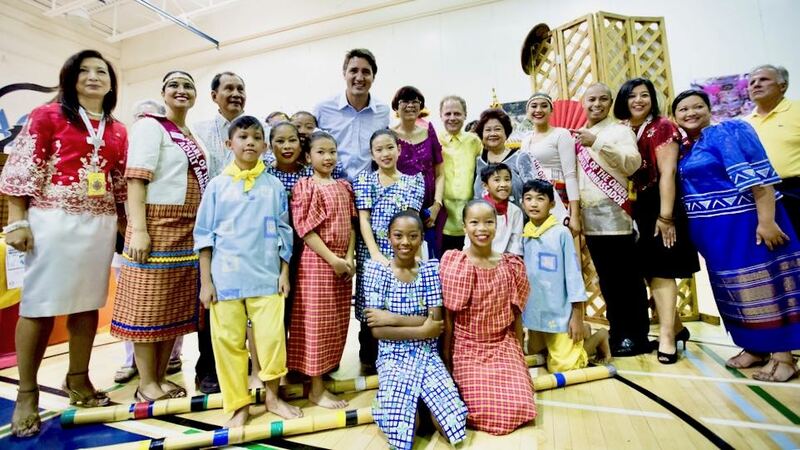 Since becoming leader of the Liberal Party of Canada, Trudeau was often seen participating at Filipino community events across the country. 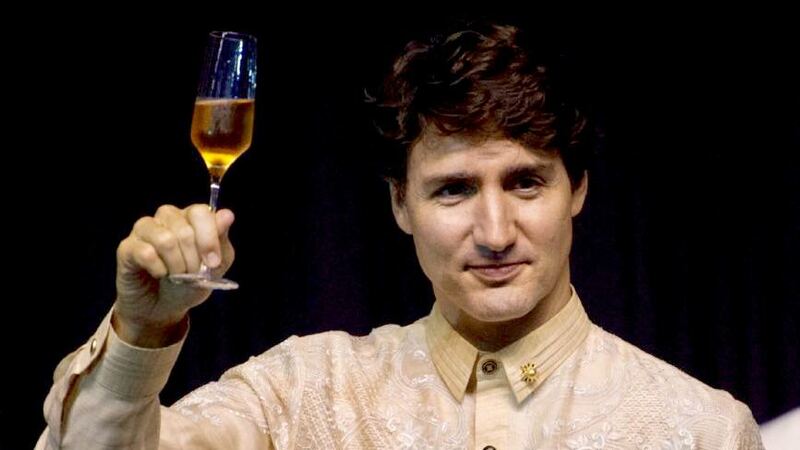 Trudeau was always willing to take a selfie with Filipino Canadians, frequently wearing gifted Barong Tagalogs to public events. He’s been to the Philippines twice. And he wasn’t actually the first Prime Minister Trudeau to visit the Philippines. In 1983, Prime Minister Pierre Trudeau paid a visit to Philippine President Ferdinand Marcos. The elder Trudeau was on an Asian trip promoting Canadian trade. 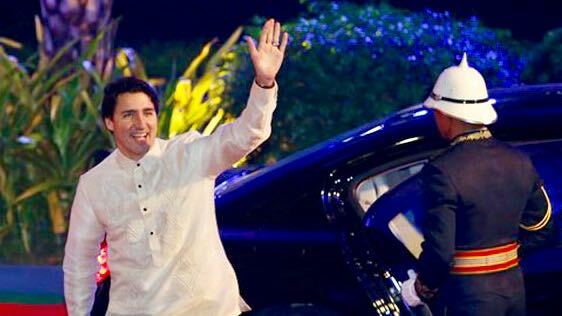 His visit to the Philippines came amid concerns raised by Canadian politicians about the Philippine’s human rights record. Justin Trudeau did not join his father for this trip. After becoming Prime Minister in 2015, Trudeau made his debut on the world stage at the APEC summit in Manila, Philippines. He also attended the 31st ASEAN summit in Manila, Philippines in 2017. Trudeau and his wife, Sophie Gregorio-Trudeau have a young family. 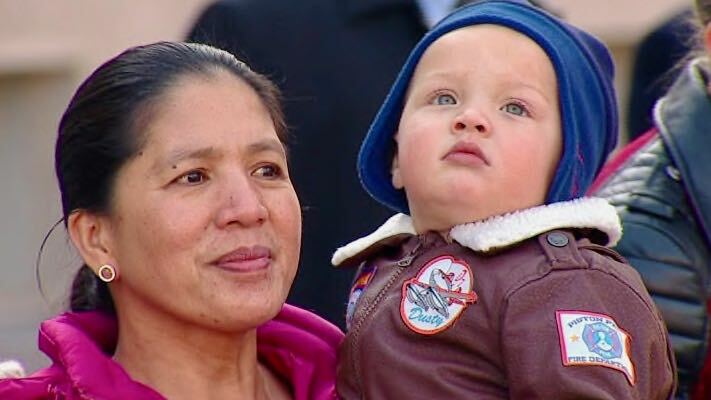 They hired a Filipino Live-In Caregiver to care for their children, Marylou Trayvilla. Trayvilla is no longer working for Trudeau. 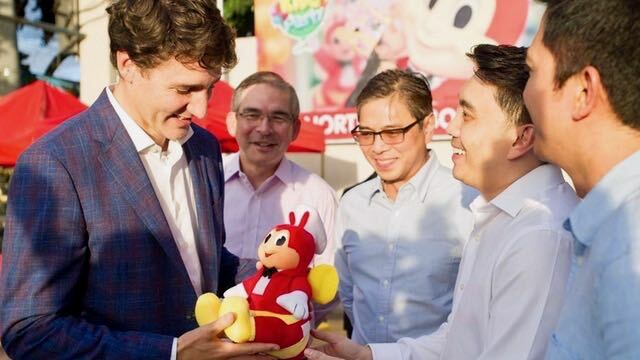 Trudeau is also a fan of Jollibee. He first paid a visit to the first Jollibee in Canada shortly after it opened in 2016, and also picked up some takeout in Tondo during his visit to the Philippines for the ASEAN summit in 2017. Canada is one of the most diverse and multicultural countries on the planet. As Prime Minister of Canada, part of Justin Trudeau’s responsibilities include recognizing the many different cultures that make up the fabric of Canadian society. That includes the Filipino community in Canada. Since becoming leader of the Liberal Party of Canada, Trudeau has issued statements on the occasion of Philippine Independence Day. Here are his statements from years past. “Today, we join together with the Filipino community – here in Canada, in the Philippines, and around the world – to celebrate the 117th anniversary of Philippine Independence. “With more than 700,000 Canadians tracing their heritage to the Philippines, our nations share deep and enduring cultural links. Last month, I was honoured to discuss this and our strong trade ties – both of which contribute to our successful bilateral relationship – when I met with President of the Philippines, Benigno S. Aquino III. “As we commemorate this occasion, we are reminded of the important contributions that Filipino-Canadians have, and continue to make, to our national fabric. Canada’s success is rooted in our unique approach to liberty through inclusive diversity. I feel incredibly lucky to live in a country that is strong not in spite of its differences, but precisely because of them. “Today, we join the Filipino community in Canada, in the Philippines, and around the world in celebrating the 119th anniversary of Philippine Independence. “More than 700,000 Canadians trace their heritage to the Philippines. Canada looks forward to continue working with the Philippines on bilateral and global issues, including peace and security, good governance and development cooperation. “Canada’s cultural diversity is one of our greatest strengths and sources of pride. This year, as we mark the 150th anniversary of Confederation, let us recognize the important contributions of the Filipino-Canadian community to our national fabric. “On behalf of the Government of Canada, I wish all those celebrating today a happy Independence Day. “Canada is home to a dynamic community of over 837,000 people of Philippine origin. The bonds between Canadians and Filipinos are the foundation of the Canada–Philippines relationship.